Whiteoak’s Macy Knoblauch (24) prepares to hit the ball on Thursday at Whiteoak High School where the Lady Wildcats battled the Felicity Lady Cardinals in volleyball action. 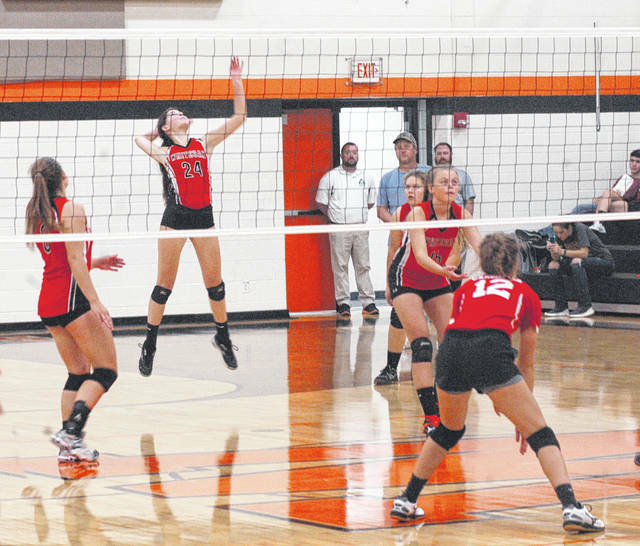 The Whiteoak Lady Wildcats varsity volleyball team hosted the Felicity-Franklin Lady Cardinals on Thursday at Whiteoak High School in a non-league match and won three sets to one. Felicity jumped out to an early 4-0 lead in the first set but the Lady Wildcats were quick to right the ship as they tied the set a nine before Macy Knoblauch gave Whiteoak their first lead with two straight aces and three service points altogether. Whiteoak steadily built their lead and were ahead 15-10 before the Lady Cardinals used four consecutive service points, after breaking the serve of Katie Ames, to tie the set at 15-15. The teams traded serves several times before Whiteoak was finally able to secure the game winning point when they broke the Lady Cardinals serve and secured the 25-22 first set victory. The second set of the match saw the teams trade the lead early before Ames stepped behind the line with the score tied at four points apiece and pushed the Lady Cats lead to 7-4. Cylee Bratton took control of the Whiteoak serve, with the scoreboard reading 8-6 in favor of the Lady Wildcats, and led her team to six consecutive service points and a 14-7 lead. The Lady Wildcats continued to play well in the set as they built their lead and eventually led 18-12 before Felicity began to rally. The Lady Cardinals scratched and clawed their way back into the game as they refused to go down without a fight and got to within one point at 19-18. From there the teams traded serves and inched their way to the finish line. The Lady Wildcats proved to be too much for Felicity as they took the second set 25-21. The Lady Cardinals put up a fight early in the third set and led 6-2 before Whiteoak was able to find their footing and battled back to tie it at seven points apiece. From there the Lady Wildcats controlled the pace of the game as they clung to a one point lead. Felicity was able to hang around and eventually tied the set at 23-23, the Lady Cardinals went on to win their third set 25-23 to force a fourth set in the best of five varsity match. Whiteoak made short work of the Lady Cardinals in the fourth set as they team combined for eight aces in the set and allowed a Felicity player to serve three consecutive times only once. The Lady Cats won the set 25-16 and secured the match victory 3-1. Lady Wildcats’ Head Coach Katie Pollard talked about the third set after the game and her team’s tendency to relax during long volleys. “We get very lazy in some volleys. We just volley back and forth, volley back and forth and then you can just see that my girls will start to relax when the ball is on the other side of the court. I feel like they get discouraged when we get into long volleys,” said Pollard. Whiteoak will be back in action on Monday when they take on the Piketon Lady Redstreaks. https://www.timesgazette.com/wp-content/uploads/sites/33/2018/09/web1_Whiteoak-vs-Felicity-Volleyball.jpgWhiteoak’s Macy Knoblauch (24) prepares to hit the ball on Thursday at Whiteoak High School where the Lady Wildcats battled the Felicity Lady Cardinals in volleyball action.